In her delightfully photographed and well-written bicycle touring cookbook (BIKE CAMP COOK), Tara Alan, shares her food and camp cooking secrets in a fast, fun and entertaining way. What kind of camp stove is recommended for bike travel. What types of cooking gear and utensils are needed. How to pack your cooking equipment on your bicycle. Which staple food ingredients you should be carrying at all times. How to pack and prepare a spice bag. How to shop for delicious foods (both close to home and in foreign countries). How to carry extra water and determine how much water you need. How to cut, cook, and prepare specific food items (such as mangoes and tomatoes). How to clean your camp stove, pot, plates, and other eating utensils. Then, in the second part of the book, you’ll be given about 50 different breakfast, lunch, dinner and dessert recipes that you can follow to quickly and easily prepare your own delicious meals while traveling the world by bike. Life is an adventure when you learn to bike, camp and cook! Listen to the author and experienced bike traveler, Tara Alan, discuss the basics of one-burner campground cooking in this new 17-minute audio interview with Darren Alff of Bicycle Touring Pro. 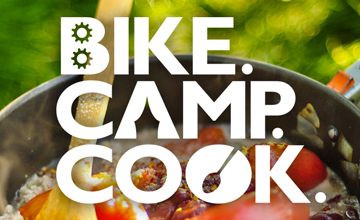 Listen to my interview with Tara Alan, and then click here to grab a copy of BIKE CAMP COOK for yourself. 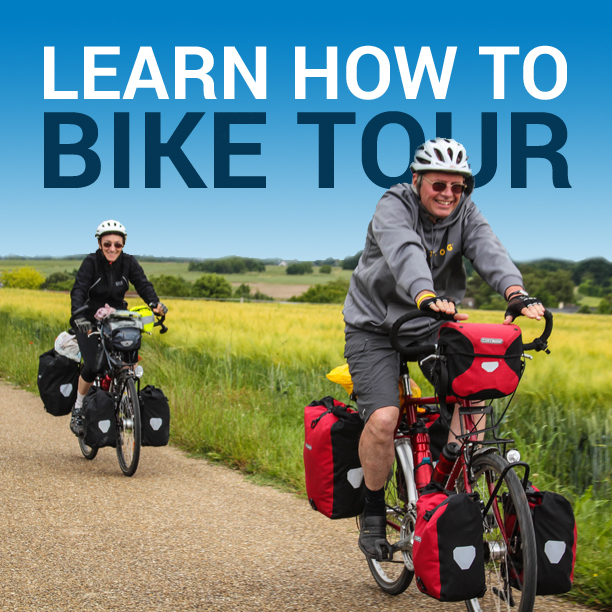 This unique bicycle touring cookbook is available in both digital ebook and printed paperback formats. Finally, be sure to visit the website at www.goingslowly.com to learn more about Tara Alan, the bike tour she and her boyfriend (Tyler) took from Scotland to Southeast Asia, and see photos from her adventures in the kitchen and all around the world. This entry was posted in Bicycle Touring Pro Articles, Books, Featured Articles, Featured How-To Articles, Lifestyle, Main Articles, Podcast, Product & Service Reviews, Products and tagged backpacking, bicycle touring, bicycle touring cookbook, bike camp cook, bike tour, bikepacking, bikepacking cookbook, camp stove, Camping, cookbook, Cooking, cycle touring, cycling cookbook, darren alff, food, stoves, tara alan, travel. Hi Darren, Great subject! I am getting some tired of eating freeze dried meals while touring. I feel that by combining those with some of the ideas from Tara’s book I can have a far more satisfying tour; I LOVE to eat! One suggestion about the cheese. Why not cover your cheese with cheese wax? This would allow a block of cheese to last virtually forever and if you bring the wax with you then you can recover the block of cheese as you use it. Another option is to use “Babybel” cheese since it is already waxed and in small packages. You could even have a variety of types of cheeses. Now if you could find a way to carry eggs on your bike without breaking them then you could cover them with mineral oil and they will last about 6 to 7 months without refrigeration. This is how people kept these items before the fridge came along. Carry some powered milk and some kind of potted meat (tuna, ham, or even hotdogs) along with some beans & rice and you’re all set. About the only things you would want to pick up is some fruit and greens but you could probably dehydrate those and bring them along too. For those of us that ride alone I would say bring a trailer with you. The added weight is worth it if it is feeding you. Boy I can’t wait to read Tara’s book. All this talk about food is making me hungry I think I will go eat lunch now. Thanks Darren for a wonderful episode and I can’t wait for the next one. I enjoyed the podcast Tara/Darren and am impressed that you’ve really thought this aspect of touring through. I suppose that in many places, you wouldn’t need to carry too many ingredients beyond spices etc and would be able to pick up the raw materials as you go. That would then cut down the amount you’d need to carry. Another aspect of the “culinary adventure” might be to ‘do what you can with what you can find’…and hopefully not “oh no; not f*+#$%@ boiled potatoes again, !” Bike touring people are a bit crazy, but REAL. Having trouble locating your winter bicycling book. Where can I find it on the internet?